Small children love to play with buckeyes. They’re the large dark brown seed of this Chestnut relative and in fact they greatly resemble the seed of the Horse Chestnut. Gary, who grew up in England, knows that seed, and the associated game, as Conkers. 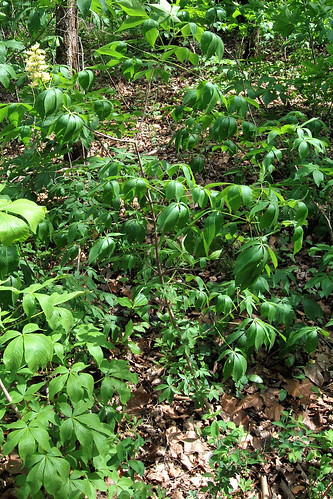 I’ve always known this plant as a large weedy shrub that grows in fence rows. I’ve never seen it as a tree, but that could be my own naivete. When I looked this up it’s supposed to grow as a tree 50-80 feet high. Perhaps I should be more observant? Seriously, I wonder if I have the ID right. If anyone has some input on this, please leave me a comment and satisfy my curiosity. 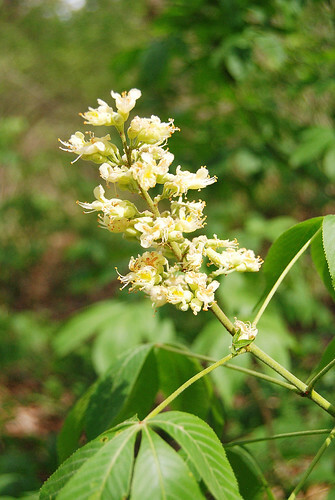 This Buckeye shrub was seen in the creek drainage at Piney Creek Wilderness on March 31, 2012. Love your website. When visiting my late grandfather, he would take me walking by the Little Piney, and he told me carrying a buckeye was good luck. A nice memory, thanks for making me remember it! Thank you. It’s surprising and often wonderful the memories we make and carry with us.